"State and federal authorities decided against indicting HSBC in a money-laundering case over concerns that criminal charges could jeopardize one of the world’s largest banks and ultimately destabilize the global financial system. Instead, HSBC announced on Tuesday that it had agreed to a record $1.92 billion settlement with authorities. The bank, which is based in Britain, faces accusations that it transferred billions of dollars for nations like Iran and enabled Mexican drug cartels to move money illegally through its American subsidiaries." "The case raises questions about whether certain financial institutions, having grown so large and interconnected, are too big to indict." "The anti money-laundering regime in the United Kingdom is broken beyond repair. How has this entirely criminal state of affairs been allowed to proliferate?. . . . They have done this in the mistaken belief that by promoting a policy of 'Light Touch Regulation', vast amounts of foreign capital will be attracted to invest in the United Kingdom, as foreign institutions seek to relocate to the City of London to take advantage of what the politicians think of as the 'climate of enterprise' they have created." "Why is the Group Head of Group Compliance of the Holdings Company, based in the UK, falling on his sword? According to Lord Sassoon's statement, it was nothing to do with him." HSBC Latin America Holdings (UK) Ltd has its address at 8 Canada Square, London, E14 5HQ, and on 5th April 2012, a gentleman called Sandy Flockhart retired as an Executive Director of HSBC Holdings plc, with effect from 30 April 2012, after a career spanning 37 years. He will be retained on the Board as a non-executive Director in order for the Board to retain access to his extensive international experience. Sandy will also retain his positions as Chairman of HSBC Bank plc, the Group's principal UK and European subsidiary, as Chairman of HSBC Latin America Holdings (UK) Limited and as a Director of HSBC Bank Middle East Ltd. The blog then goes on to explain how UK laws on money laundering have major extra territorial application, and then cites HSBC chief executive Stuart Gulliver who has said the bank accepted responsibility for its past mistakes. "I don't think the word 'mistakes' hardly covers the entirety of what has been going on here. You don't just set up a dodgy bank in a criminal environment, hide it inside two separate controlling corporate entities, with separate directors, move vast sums of Mexican drug money around the world, and then try and fob this off as a 'mistake'. There was a clever commercial mind behind these structures and their holdings . . . Being fined by a regulatory body is an inadequate a sanction for complicity—however peripheral, and whether it is willful or negligent—in an international criminal network which causes many thousands of deaths each year. 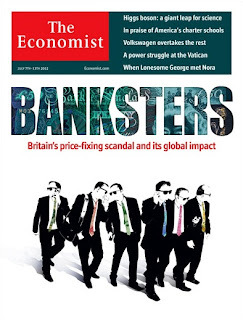 In America they considered HSBC too big to jail because of fears of blowing up the financial system. In Tax Haven UK they considered HSBC too big to jail for simpler, more timeless reasons. Because, well, er . . . . we love the dirty money.